Recent Arrival! Navigation/NAV/GPS, Heated Leather Seats, Sunroof/Moonroof, All-Wheel Drive, Good Tires, Good Brakes, Back-up Camera, Bluetooth Hands Free, Satellite Radio, AWD, 11 Speakers, 4-Wheel Disc Brakes, ABS brakes, Active Park Assist, Adaptive Cruise Control, Adaptive suspension, Air Conditioning, Alloy wheels, AM/FM radio: SiriusXM, Auto High Beams, Automatic temperature control, Brake assist, CD player, Delay-off headlights, Dual front impact airbags, Dual front side impact airbags, Electronic Stability Control, Equipment Group 102A Reserve, Exterior Parking Camera Rear, Forward Sensing System, Four wheel independent suspension, Front Bucket Seats, Front Center Armrest, Front dual zone A/C, Front License Plate Bracket, Fully automatic headlights, Garage door transmitter, Genuine wood dashboard insert, Genuine wood door panel insert, Heated door mirrors, Heated front seats, Heated Rear-Seats, Illuminated entry, Knee airbag, Lane Keeping System, Leather steering wheel, Memory seat, Navigation System, Navigation w/Voice Recognition, Occupant sensing airbag, Outside temperature display, Overhead airbag, Power door mirrors, Power driver seat, Power passenger seat, Power steering, Power Tilt/Telescoping Steering Wheel, Power windows, Premium Floor Mats, Radio: Lincoln Premium Sound System w/SingleCD/MP3, Rain Sensing Wipers, Rear Parking Sensors, Rear seat center armrest, Remote keyless entry, Security system, Single Panel Moonroof, Speed-sensing steering, Split folding rear seat, Steering wheel mounted audio controls, SYNC Communications & Entertainment System, Tachometer, Technology Package, Telescoping steering wheel, Tilt steering wheel, Traction control, Variably intermittent wipers. CARFAX One-Owner. Clean CARFAX. 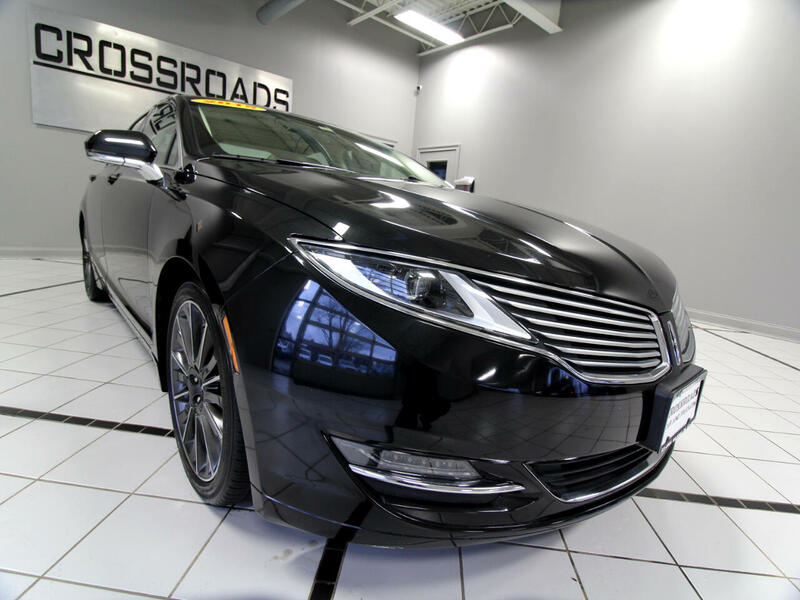 Tuxedo Black Metallic 2015 Lincoln MKZ 4D Sedan AWD EcoBoost 2.0L I4 GTDi DOHC Turbocharged VCT 6-Speed Automatic with Select-Shift Odometer is 18240 miles below market average! 22/31 City/Highway MPG Awards: * 2015 IIHS Top Safety Pick * 2015 KBB.com 5-Year Cost to Own Awards Reviews: * If you're looking for an attractive sedan, loaded with high-tech gadgets, and putting an emphasis on comfort over performance, then the Lincoln MKZ could be the ticket. That goes double if you want the fuel economy of a hybrid, but don't want to pay a premium for it. Source: KBB.com * Eye-catching design; high fuel economy from available hybrid model; many standard features. Source: Edmunds * The 2015 Lincoln MKZ is simply breathtaking from front to back. Its classic split-wing grille and beautiful flowing curves, inspired by a waterfall, are merely an indication of its unique inner workings. If fewer fill-ups appeals to you, choose the standard 2.0L EcoBoost engine. It offers up to 33 mpg hwy with 240hp and 270 lb.-ft. of torque (FWD: 22 mpg city/33 hwy. - AWD: 22 mpg city/31 hwy). For more of a rush, opt for the 3.7L V6. It increases output to 300hp and 277 lb.-ft. of torque, and still offers impressive economy, thanks in part to shutters in the front grille that automatically close at speed to help you slip through the air with less resistance (FWD: 19 mpg city and 28 hwy. - AWD: 18 mpg city and 26 hwy). The Lincoln MKZ also provides a Hybrid option, which gets 38 mpg city and 37 hwy. The Lincoln MKZ Hybrid uses a state-of-the-art lithium-ion battery for more power and less weight. In electric mode, it can run up to 62 mph. The 2.0L Atkinson-cycle engine and electric traction motor recharge the battery while you drive. The open spaciousness of Lincoln MKZ is a result of what is not there. For instance: no traditional shifter. Lincoln eliminated the intrusive knob to create a thin center console that flows gracefully through the cabin. Step back and soak in the stunning, floating dual-arch design, inspired by the shape of a calla lily. Lift your eyes to the instrument panel, and you will recognize the rhythmic symmetry of a manta ray. Lincoln eschewed conventional design in interior lighting as well.